Aromatic nose, black and blue fruit dominate with a delicate white blossom and lavender notes gently balancing the depth of fruit characters. Made from 13 Syrah parcels, it is utterly charming. The balance is exquisite and the restrain and precision of purity make it a marvel. A debutante wine, knowing just the right amount of style, charm and character to leave us wanting to get to know it better. A very fine wine with jasmine and blossom on the finish. 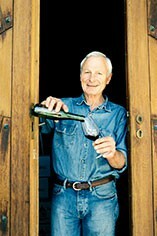 Rene de-stemmed 50% of the Ampodium crop in 2011. The fruit is traditionally sourced from 13 different lieux-dits. There is no Viognier, but the wine is aromatically attractive with gentle aromas of wood spice and violet. A satisfying mouth-feel follows, with pleasingly orchestrated tension between crisp acidity and finely etched tannins. 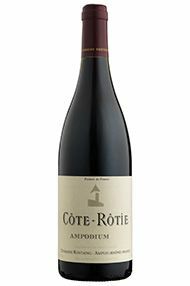 The Wine Advocate - The 2011 Cote Rotie Ampodium, which is aged in both demi-muids and older wood, is a Burgundian-styled effort with elegant, soft, sensual aromas and flavors of flowers, raspberries, black cherries (kirsch), licorice and forest floor. The stunning aromatics are followed by a medium-bodied wine with sweet tannin as well as outstanding equilibrium. Jancis - Fragrant and lightly stemmy. A delicate leaf – tea or tobacco. And lightly floral. Very pretty. Very very refined tannins. Delicate and elegant and persistent. 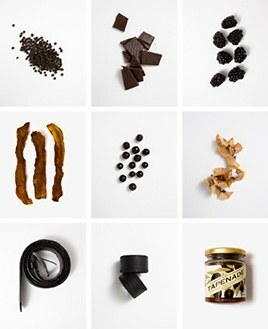 Slides across the palate even now. Parker - The 2011 Cote Rotie Ampodium, which is aged in both demi-muids and older wood, is a Burgundian-styled effort with elegant, soft, sensual aromas and flavors of flowers, raspberries, black cherries (kirsch), licorice and forest floor. The stunning aromatics are followed by a medium-bodied wine with sweet tannin as well as outstanding equilibrium.